Take a moment to think of the crocodile. What springs to mind? Primitive, primeval monsters, vicious stupid killers who ambush cute animals innocently coming for a drink? This is the image conveyed by popular TV nature specials. But as we learn more about the crocodile, we can come to respect this animal, which is indeed driven by a different biology than our own. The crocodile's head shows how it is adapted to its aquatic lifestyle: the eyes and nostrils are at the top of the skull so it can remain submerged while breathing and keeping an eye out for prey (or predators if it is less than a couple of years old). 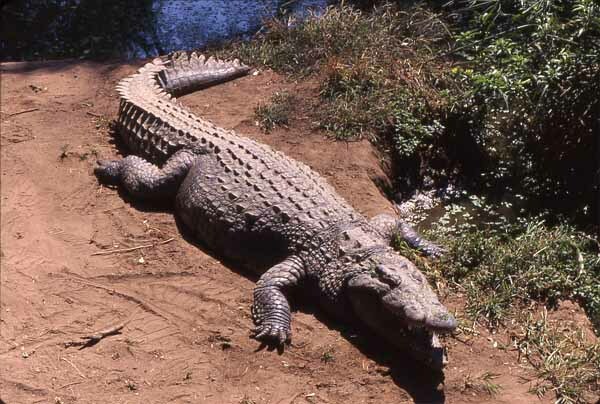 In captivity, such as this one, crocodiles can grow huge, and never stop growing throughout their lives. In the town of Victoria Falls, Zimbabwe, the Spencer's Creek Crocodile Farm raises thousands of the animals for meat and leather. Here, the breeding population consists of numerous full-sized individuals, such as this one. Here it is basking to raise its body temperature, a characteristic reptile behavior. Along the Shire River in Malawi, a tributary of the Zambesi, live the country's highest density of crocodiles. Protected within Liwonde National Park, they thrive. 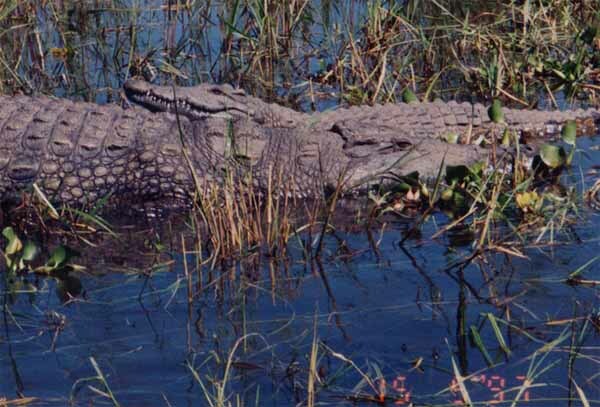 Crocodiles are remarkably social compared with other reptiles, and usually seek each others company. This pair was resting within a few yards of the visitor lodge at Mvuu Camp within the park. 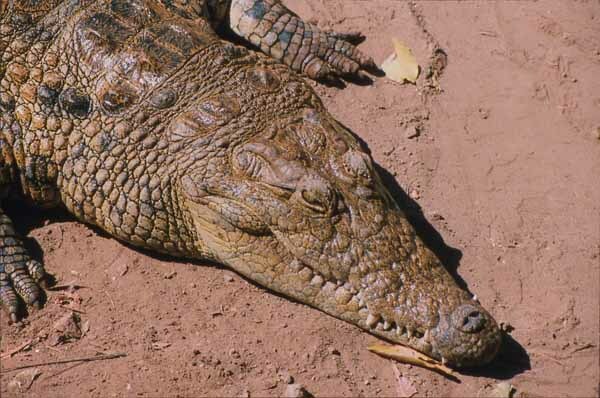 Due to their low metabolism, crocodiles do not need to eat much for their size and are quite content to spend most of their time lying in the sun.